Threats, finger-pointing abound as Coalition and Opposition battle out bill for two-year budget on several fronts. In a controversy featuring much harsh rhetoric and grandstanding, a battle is raging in the Knesset between the Coalition and the Opposition over the budget. The sequence of events can be followed through the statement made by various Knesset Members, outlining their grievances on both sides. 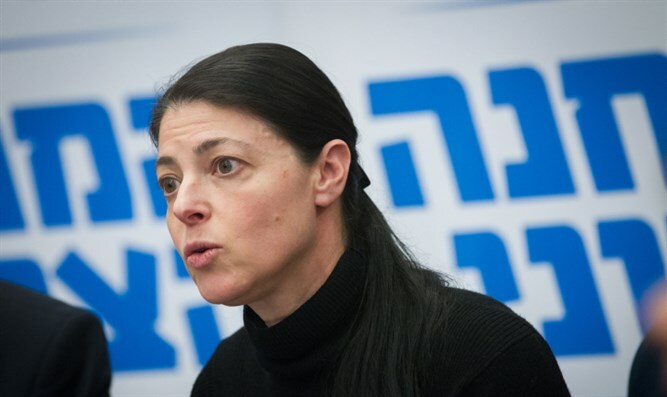 MK Merav Michaeli (Zionist Union), one of the leaders of the Opposition, sent an urgent letter to the Knesset Speaker demanding he intervene to oppose what she called "the Coalition Chairman's announcement of sweeping and non-substantive resistance to all legislation initiated by the Opposition." Michaeli wrote to Speaker Yuli Edelstein that "the Coalition Chairman, MK David Bitan, announced this morning that the coalition will oppose all legislation proposed by the opposition, including bills that enjoy the support of the Ministerial Committee for Legislation, due to 'Opposition party representative's conduct in yesterday's Finance Committee meeting.'" Mk Michaeli claims that MK Bitan reiterated the intention in a Knesset committee meeting this morning, saying Opposition-initiated bills shouldn't be brought up for second and third readings in the Knesset plenum next week. She added that "the opposition conduct to which the Coalition Chairman is referring was a filibuster against an unconstitutional two-year budget law. Filibustering is a basic tool of the Knesset Opposition. Michaeli made clear that the Opposition will not stand for it. "For us, this breaks all standards of reasonable parliamentary conduct. The Opposition will boycott the plenum until the Coalition turns away from this bullying travesty of a decision. I call on you [Speaker Edelstein] to intervene immediately to resolve the situation." Opposition leader Yitzchak Herzog claims that "Coalition Chairman Bitan is acting like a bully. His empty threats are a sad attempt to intimidate MKs who are leading a fitting and just fight against a law that tramples on the Knesset's status and the authority of the Financial Committee and the public's representatives. "The fight led yesterday by MKs Stav Shafir, Yael Cohen-Paran, Yossi Yona and Miki Levi is a fight for basic democracy that is slowly being eroded in Israel simply because Netanyahu prefers a near-monarchical autocracy where there is no accountability - only survival. We won't let the Knesset turn into Netanyahu and his cronies' rubber stamp." MK Bitan has indeed notified the heads of the Yesh Atid and Zionist Union factions this morning that the Coalition will vote against any and every bill initiated by the Opposition without consideration for the recommendations of the Ministerial Committee for Legislation, this because of Opposition members conduct in the Finance Committee meeting yesterday, which he claimed flew in the face of generally accepted standards of behavior. Bitan: "Up to today the Coalition has dealt with all proposed laws in substantive fashion, without regard its origin in the Coalition or the Oppostion. Rather than follow suit, the Opposition has broken all conventions and made a joke out of the Finance committee's work yesterday." Following all these developments, Knesset Speaker Yuli Edelstein addressed the Opposition's intention to boycott the plenum debates from the Speaker's podium: "Every morning I get all sorts of letters declaring intentions to take this or that disciplinary step, usually from the Coalition. Now the Opposition is doing it. This is not the way parliament should conduct itself. "There are committee meeting every Monday to discuss rules of procedure. There, people talk and don't always agree. There are enough parliamentary trick that can be employed in compliance with the rules of procedure. If we start boycotting and punishing from both sides, there won't be much left of this institution and everyone will feel the damage, the MKs and the Israeli public." The controversy came to a temporary resolution after a meeting today in the Knesset Speaker's office. Participants included MKs Michaeli, Bitan, Ofer Shelah of Yesh Atid, and Ahmad Tibi of the Joint Arab List. An agreement was reached to suspend all plans for boycotting of laws and/or plenum debates. Speaker Edelstein summarized the situation: "We won't actually reach a vote on the budget if this situation continues. In the end everyone is hurt by it. I propose that everyone stop digging themselves in and get back to parliamentary work. Therefore, we have agreed that the Opposition will return to the plenum and the budget debates will continue in the Finance Committee."